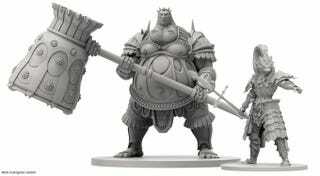 In less than two hours, an amazing-looking board game based on Dark Souls has raised more than $200,000 on Kickstarter. They were only asking for $70,000, and it was funded in three minutes. The game even has the series’ trademark bonfire mechanic, where players can level up, rest, and head out back into the world. The problem? Bonfires also reset the world, and all the enemies you’ve defeated have returned. Awesome. Each time you decide where to go, you will experience a new danger as you explore, with each new location a real risk to your hard-won progress. If you die, then you drop everything you have collected and reappear at the nearest bonfire. So do you return to the bonfire to rest and spend Souls to strengthen up, but in doing so fully reset the locations? Or do you press on and pray that the next encounter isn’t beyond your capabilities? After all, the next location may contain a clue to the Boss and how to defeat them. You’ll even equip items with a similar interface to the game itself. The attention to detail is astounding, and the figures might be worth it on their own? I’m not even that into board games and I’m tempted to buy one of these. The game’s scheduled for April 2017, so it’ll be a while before it materializes. (Just in time for Bloodborne 2?) If you’re wary of crowdfunding efforts, the game will show up in retail, too, so you can safely wait. Several stretch goals have already been added, including a pyromancy class, and there’s likely to be several more before the campaign is up in 26 days.